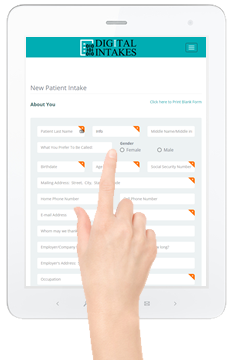 We've delivered Patient Intake Solutions for 23 years to over 10,000 practices Nation-wide. Have a quick question? Send us an email and receive a quick reply. Need more extensive support? Call us, we'll be happy to help. 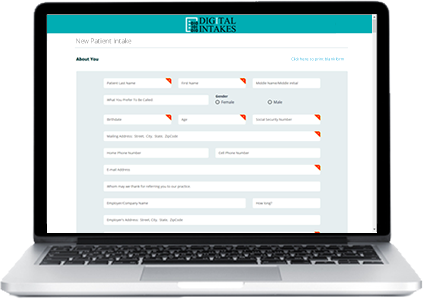 Quickly setup your FREE account and have clients filing out digital forms in minutes. We use bank grade encryption, regular security scans, controlled access, and device pre-authorization requirements to keep your client's sensitive information safe and sound. Guessing what they wrote can be risky. Digital forms are typed and easy to read. Stop wasting time and money scanning and shredding. Create your own forms or pick one of our editable pre-made forms. It's easy. Clients notice when you're eco-friendly. It's a great first impression. Clients that fill out forms from home provide better more thorough answers. Some practices think going digital means posting a form template on their web page and voila, "digital". Sending sensitive data through unsecure channels like email or unencrypted web pages puts your clients information at risk and is not HIPAA compliant. To do it the right way is expensive to setup and maintain. Sign up now. For just $12.90 per month your practice gets unlimited submissions and all the features and security for less than half of what our competitors charge.